Intel is reportedly looking to unify specifications for mSATA solid state drives used in Ultrabooks. The company is aiming to work with NAND flash companies and PC vendors to help get the job done ahead of specs that are said to be finalized in September, according to sources at memory makers as reported by DigiTimes. The new standard will be known as Next Generation Form Factor (NGFF) which will ultimately allow for higher capacity SSD storage versus what is currently available on mSATA. Current specifications limit the number of chips that can be used to a maximum of four or five because they can only be installed on one side of the PCB. 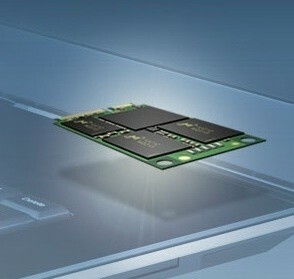 NGFF will allow Ultrabooks to push past the 512GB flash storage barrier by utilizing NAND chips on both sides of the PCB. The SSDs will be the exact same thickness and width as current drives with the only difference being length. 42mm, 60mm and 80mm lengths are all likely candidates to make the final specification but it’s still too early to know for sure which will prevail. The report notes that most PC vendors and several big name players in the NAND flash business are participating in talks, including Micron, Samsung and SanDisk. Although the new specifications are expected to be finalized next month, we likely won’t see products following the new guidelines until at least 2013. Vendors are said to be optimistic about the new plans but they have expressed concerns regarding current and older components still in inventory.